Two award winning faculty members guide you through a highly-focused review that emphasizes key areas of relevance for the exam, leaving out the superfluous material. The review will also indicate elements that require additional study so that you can allocate your time effectively. Highly tested materials as well as past exam trends are also covered. 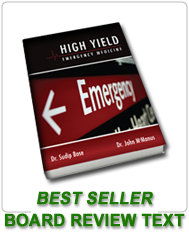 Convenient and effective, this review is a perfect supplement for the busy emergency physician. The course is based on ABEM’s Clinical Model of the Practice of Emergency Medicine which defines the Emergency Medicine realm. Highly tested items will be emphasized. This review will not only sharpen your clinical knowledge for the test but will strengthen your EM knowledge base overall. Our course is available for you to access as many times as you wish, until 1 day after the ConCert exam. This review is available as an online course, as a review text or both! If you purchase both the online review and the review text, we guarantee you will pass the exam or your money back!